"It was an incredibly violent attack. Fortunately our cameraman is fine, he is made of stern stuff," Mr O&apos;Donoghue told the Today programme. "This is a constant feature of these rallies - a goading of the crowds against the media," Mr O&apos;Donoghue added. Mr O&apos;Donoghue said Mr Trump&apos;s 2020 election campaign, which he thinks has begun, will be as "hostile and ill-tempered and divisive as the one we saw last time". 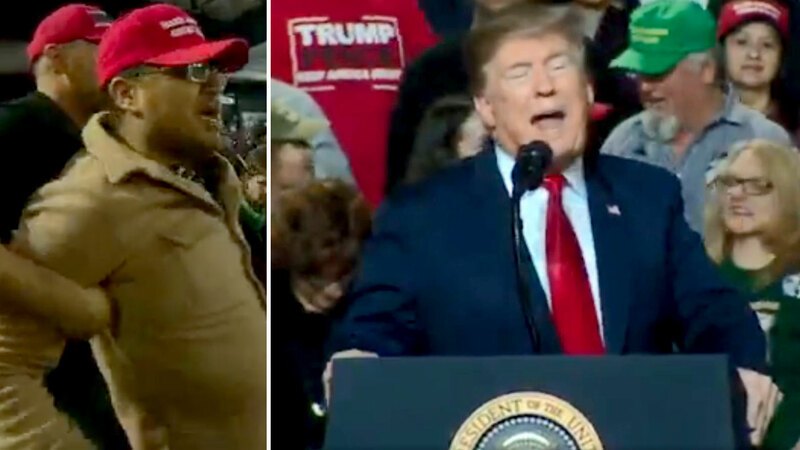 Mr Trump&apos;s "Finish the Wall" rally in El Paso was the first dueling rallies of the 2020 campaign season. Mr Trump went head-to-head against counterprogramming by Beto O&apos;Rourke, a former Democratic congressman and potential Trump rival in 2020, who argued that walls cause more problems than they solve. The rallies across the street from each other served as a preview of the heated years-long fight over the direction of the country. And they made clear that Mr Trump&apos;s long-promised border wall is sure to play an outsized role in the presidential race, as both sides use it to try to rally their supporters and highlight their contrasting approaches. Standing in a packed stadium under a giant American flag and banners saying "FINISH THE WALL," Mr Trump insisted that large portions of the project are already under construction and vowed to fulfill his 2016 campaign promise regardless of what happens in Congress. "Walls work," Mr Trump said, whose rally was repeatedly interrupted by protesters. "Walls save lives." Mr O&apos;Rourke, meanwhile, held a countermarch with dozens of local civic, human rights and Hispanic groups in his hometown, followed by a protest rally attended by thousands on a baseball field within shouting distance from the arena where Mr Trump spoke. "With the eyes of the country upon us, all of us together are going to make our stand here in one of the safest cities in America," Mr O&apos;Rourke said. "Safe not because of walls but in spite of walls." More than a half-hour in his rally, Mr Trump had scarcely mentioned immigration, offering just a passing suggestion that those chanting "Build the Wall" switch to "Finish the Wall." Instead, he mocked Mr O&apos;Rourke, insisting the Texan has "very little going for himself except he&apos;s got a great first name" and deriding his crowd size, even though both men drew thousands. "That may be the end of his presidential bid," Mr Trump quipped, adding: "You&apos;re supposed to win in order to run."